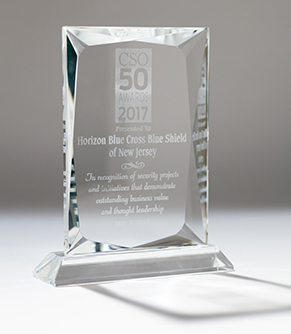 Horizon Blue Cross Blue Shield of New Jersey (Horizon BCBSNJ) has been honored with a 2017 CSO50 Award from IDG's CSO (Chief Security Officer). This prestigious honor pays tribute to a select group of 50 organizations that have demonstrated that their security projects and initiatives have created outstanding business value and thought leadership for their companies. Horizon BCBSNJ accepted the award at the CSO50 Conference + Awards held last month at the Scottsdale Resort at McCormick Ranch, Scottsdale, Arizona.Horizon BCBSNJ won for the “Domain Security Platform” it designed to automatically identify, monitor and block potentially malicious, newly registered external domains and websites that would likely to pose an elevated risk to the company.“With cybercrime-based attacks remaining a leading cause of data breaches, and adversaries continuously changing tools, tactics and procedures, health care organizations in particular have been challenged to keep pace,” said Douglas Falduto, vice president, Administration and Chief Security Officer for Horizon BCBSNJ. “Our platform addresses threats that are not yet detected by mainstream security products and provides our organization with time to respond to threats when they are detected. Horizon is ever vigilant in keeping our members’ information safe and secure and thwarting attacks that can disrupt our business operations,” Falduto added. "The stakes have never been higher when it comes to protecting an organization's sensitive data from criminals and breach," said Joan Goodchild, editor-in-chief of CSO. "Security leaders are expected to not only deliver protection, but also to drive business initiatives. Our annual CSO50 awards recognize security projects that enhance defense and also deliver ROI." About CSOCSO is the premier content and community resource for security decision-makers leading “business risk management” efforts within their organization. For more than a decade, CSO’s award-winning web site (CSOonline.com), executive conferences, strategic marketing services and research have equipped security decision-makers to mitigate both IT and corporate/physical risk for their organizations and provided opportunities for security vendors looking to reach this audience.To assist CSOs in educating their organizations’ employees on corporate and personal security practices, CSO also produces the quarterly newsletter Security Smart. CSO is published by IDG Enterprise, a subsidiary of IDG. Company information is available at www.idgenterprise.com.About the CSO50 AwardsLaunched in 2013, the CSO50 Awards recognizes 50 organizations for security projects and initiatives that demonstrate outstanding business value and thought leadership. The CSO50 Awards are scored according to a uniform set of criteria by a panel of judges that includes security leaders, industry experts, and academics. The 2017 awards will be presented at the CSO50 Conference + Awards, May 1-3, 2017, at the Scottsdale Resort at McCormick Ranch, Scottsdale, Arizona.